Craving vs Hunger: It’s healthy to eat, not to over-eat. Know the difference! Ever wondered what the difference between a craving and a genuine hunger really is? This distinction is important to recognize as one is need while the other is simply greed! 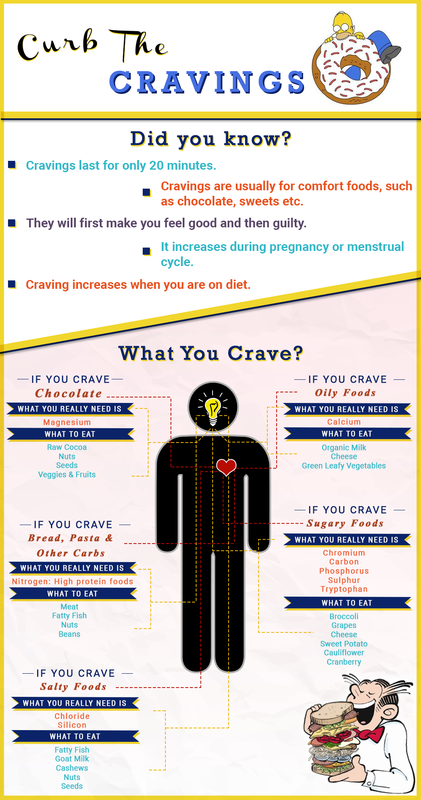 Often, cravings pass as hunger but are actually quite different in nature and results. Hunger is an in-built feeling. It’s your body’s way of letting you know it needs strength and energy to survive. There are various ways of how we experience it. Out of the many signs that can be listed, let’s harp upon a grumbling stomach, which we regard as “hunger pangs.” Also, headache and weakness which is caused due to hunger. What you’ll need then is something nutritious and filling to eat and not sweet desires such as cookies, candy, cake, etc…Once this feeling is established we term it as an inevitable urge to eat. It’s completely normal and natural. So hunger is the body’s way of letting you know you need food. Cravings differ from person to person. These are sudden food temptations regardless of when you last ate; rather they occur as a result of mood swings, emotional weakness, sadness, boredom, loneliness or anxiety. Having said that, it’s important to state those strange moments when you’re merrily going about your day and suddenly you get clobbered with the thought of food! While your stomach is completely full and you’re perhaps in no mood to stuff yourself any further, yet the desire to eat more just refuses to subside! You might regard that as a “hunger pang” or “being foodie”, however scientifically that urge to eat when you’re completely full is called CRAVING. Often, our cravings are confused with hunger and we end up overeating. To know the difference you need to listen to your body and know whether your body is truly hungry or you’re craving a food due to temptation or emotional reasons. Now-a-days when the food is just a call away, you generally lose your focus and fall for your cravings. Giving into too much craving can lead to overeating, unhealthy eating, and cause unwanted weight gain. One way of differentiating between the two is by rating your hunger on the scale of 10, where ‘1’ would mean you are starving and ‘10’ would imply to your stomach being full. For a healthy lifestyle, other than working out, it is important to keep a check on what you are eating. For those who aim for a healthy body need to fight these cravings that occur out of nowhere. Hope this article helps you in maintaining your food habits in a healthy way. Tip: Cravings tend to last for about 20 minutes, a fact you can always keep in mind while focusing on not-to-over-eat. Remember, they will pass if you resist them.